Performers include: Michael J. Anderson, Adrienne Barbeau, Clancy Brown, Tim DeKay, Cynthia Ettinger, Carla Gallo, Amy Madigan, Nick Stahl, Debra Christofferson, Clea DuVall, Toby Huss, Brian Turk, Diane Sallinger, Patrick Bauchau, and Ralph Waite. Set in the dust bowl during the Great Depression, this series follows two separate plotlines that are on a collision course. Ben Hawkins (Nick Stahl) is a mysterious 18-year-old with strange healing powers who joins a traveling circus when it passes near his Oklahoma home. Shortly thereafter, Ben begins to have strange dreams and visions of Henry Scudder, a drifter who crossed paths with the circus years earlier and shared Ben’s abilities. 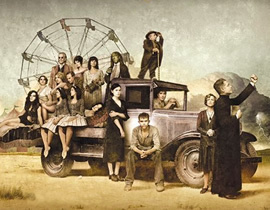 Travelling with the circus are dwarf circus co-manager, Samson (Michael J. Anderson); Samson’s right-hand man, ex-baseball player Clayton “Jonesy Jones (Tim DeKay); mother-daughter fortune tellers Apollonia and Sofie Agnesh Bojakshiya (Diane Salinger and Clea DuVall); blind mentalist Professor Ernst Lodz (Patrick Bauchau); bearded lady Lila Villanueva (Debra Christofferson); snake-charmer Ruthie (Adrienne Barbeau) and her strongman son, Gabriel (Brian Turk); and the Dreifus family, which consists of striptease show manager, Felix “Stumpy” (Toby Huss), his wife Rita Sue (Cynthia Ettinger), and daughters Libby (Carla Gallo) and Dora Mae (Amanda Aday). The second storyline follows a California-based Methodist preacher, Brother Justin Crowe (Clancy Brown). He lives with his older sister, Iris (Amy Madigan), and is mentored by Reverend Norman Balthus (Ralph Waite). Brother Justin has prophetic dreams similar to Ben’s and discovers that he can bend others to his will, making their sins manifest in the form of horrible visions. He’s convinces that he’s doing God’s work and doesn’t realize that Ben and the circus are traveling closer every day. As to all the Hoopla surrounding Ben being lost then found and then lost again. Just let the boy live. He found his own world that he wants to enjoy in. Why must we pigeon hold him to inside the box living. I`m rooting for you Ben. And just maybe you can stumble across the Scarlet Spider Uniform and then Hot D@#! Watch out World ! NEED TO MAKE MORE SERIES!!!!!!!!!! !